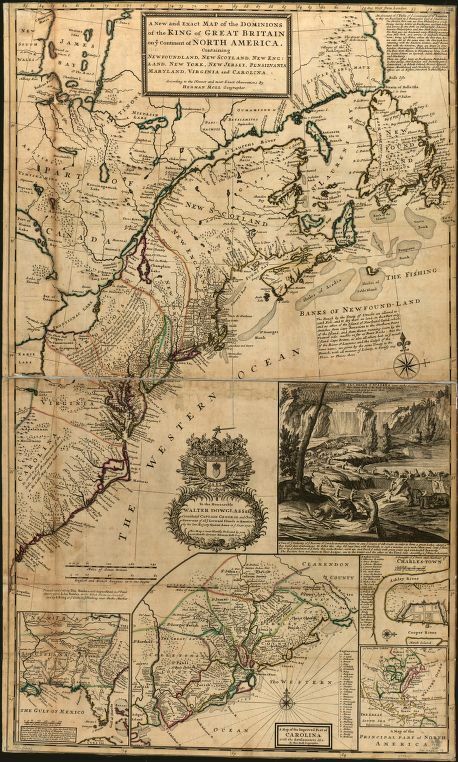 This essay provides a brief chronological overview of the visual evidence available for teaching about the British colonies in North America. Mancall provides information on some of the first European images of America from the 1590s that were crucial for Britain’s colonizing mission, the depictions of the Pequot War, and the drawings that addressed the political crisis of the 1760s. 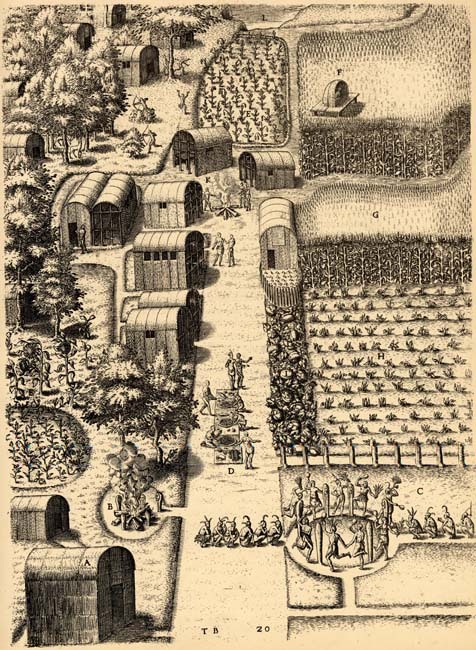 In 1585 the second group of potential English settlers arrived on the outer banks of modern North Carolina and established themselves at a place known as Roanoke. By the end of the decade the newcomers would be gone and their disappearance would become one of the greatest mysteries in American history. But in 1585 the English who arrived there had two things on their mind. First, they were eager to figure out a way to survive in their new environment. Second, they wanted to record what they saw, especially the natural resources of the region and its indigenous inhabitants. The English were well established for the latter task because they arrived with a young mathematician named Thomas Harriot and an artist named John White. By the time the two returned to England later that year, they had begun to create a composite picture of what this part of the mid-Atlantic coast looked like. Harriot’s report appeared without any images in 1588 and Richard Hakluyt reprinted his words in a large collection of travel narratives in 1589. 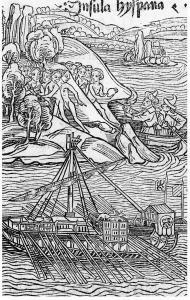 But in 1590 a new edition came rolling off the presses in the workshop of the Flemish engraver Theodor de Bry in Frankfurt-am-Main. 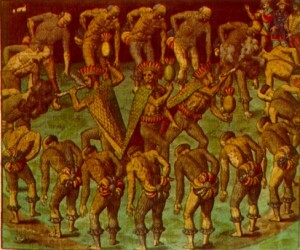 It was the first European work about the Americas to appear simultaneously in four languages but it became widely known because it included engraved versions of some of White’s water colors. The book, entitled A Briefe and True Report of the New Found Land of Virginia, introduced Europeans to the Carolina Algonquians. The book’s pictures have become the most widely reprinted visual evidence from the Anglo-American colonial period. Over the course of the sixteenth century other images appeared, but few circulated very far. Though some of this visual evidence is compelling, until the 1590s much of it remained little known. 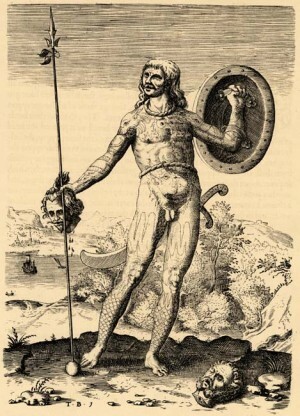 But the de Bry workshop changed Europeans’ understanding of what the Americas-and Americans-looked like. Among the books coming out of the workshop was a 1592 imprint entitled America Tertia Pars. It contained about thirty images, including six that depicted Brazilian Tupinambas participating in cannibal feasts (based on the account of the German captive Hans Stade). [Figure 2] These images helped create an image of American savagery that would remain embedded in many European cultures for generations. But the images in Harriot’s Briefe and True Report provided an alternative vision, and as such have become the ideal tool for teaching about the early American era. The engraved versions of these pictures depict indigenous men and women in poses reminiscent of classical antiquity and myriad Native Americans engaged in tasks ranging from crafting a canoe from a tree trunk to fishing and then grilling the catch. Most important, the book included two sets of images that can be used to teach about the early colonial period. 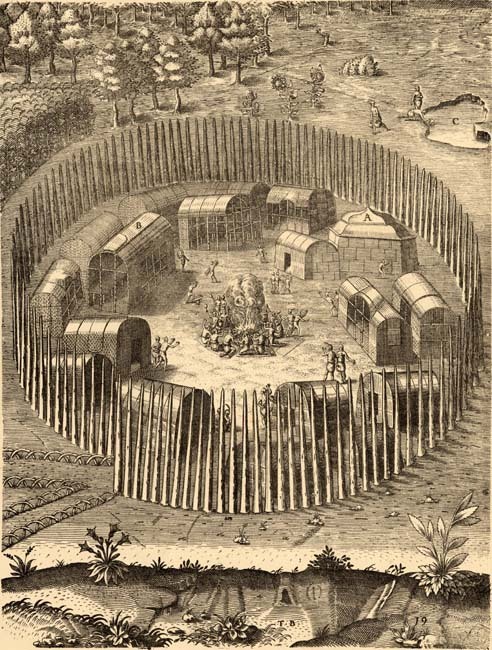 The first is a pair of towns-the palisaded community at Pomiooc [Figure 3] and the open and sophisticated settlement at Secota (or Secotan). [Figure 4 These town views showed Europeans, including the English, that it would be possible to settle eastern North America. If Indians could create such successful towns, the text and pictures argued, imagine what the newcomers could do. The second set of images depicted the ancient inhabitants of Britain, including the dreaded Picts who had fought the Romans. 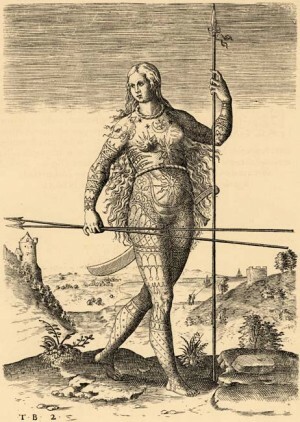 The engraved versions showed them as more heavily tattooed than the Carolina Algonquians and also fierce: a man holds a head still dripping blood in his hand and another severed head lies at his foot, [Figure 5] while the woman is armed with the broad sword and arrows of a warrior. [Figure 6] These images confirmed a message in the text that the ancient residents of Britain were more savage than the Americans White had painted. The pictures became crucial for the colonizing mission, and students can interpret them and figure out the same logic. 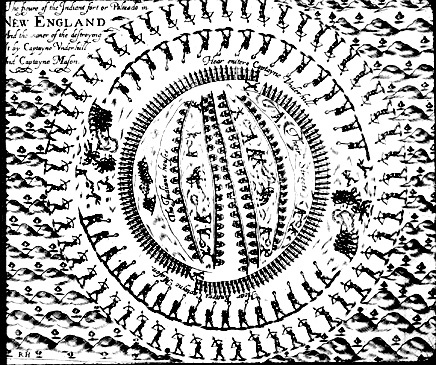 Those of us who use images to teach history all benefit from this auspicious start, and then face a problem: for the rest of the colonial period the Anglo-American colonists produced few images (at least images seen by more than a small number of individuals), and there is only a small number of indigenous images for the territory the English colonized. 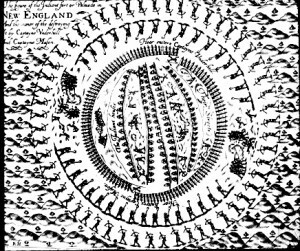 Some images are crucial, including a depiction of the Pequot War of 1637 [Figure 7] which corresponds with the brutal account of the battle provided by William Bradford in his classic history, known to us as Of Plymouth Plantation. But such images are rare-and much rarer than the profusion of images generated in New Spain. 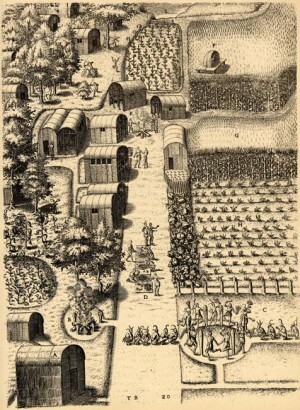 When Robert Beverley wanted illustrations for his history of Virginia, first published in 1705, he used newly engraved versions of the pictures that had appeared in Harriot’s book. Some of those images would appeared again in the 1720s and 1730s with the publication of Bernard Picart’s newly engraved versions in Cérémonies et Coutumes religeuses de tous les peoples du monde. 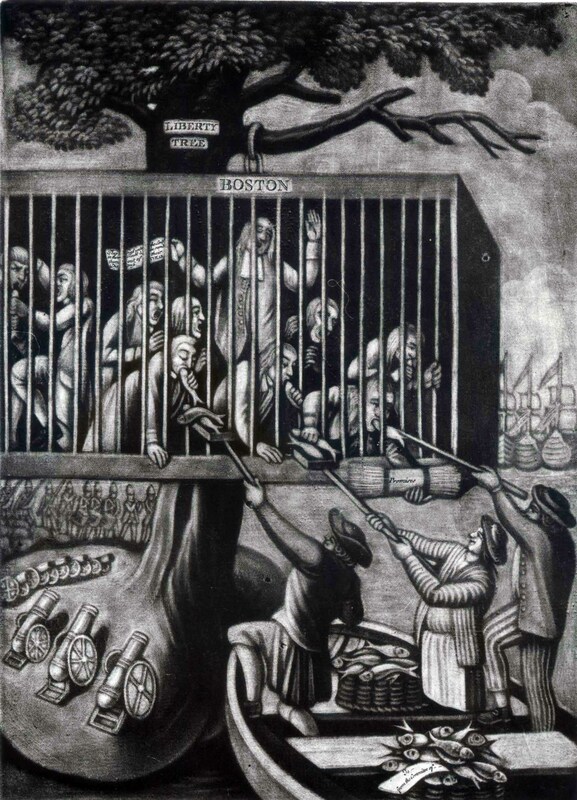 While Anglo-American colonists did create some images, especially portraits and pen-and-ink drawings, the most notable pictures would not appear again until the political crisis of the 1760s. Those images, as it turns out, are also ideal for teaching about the colonies, especially about the political culture of the late colonial era. Of these several are worth serious consideration in the classroom. One piece of anti-Quaker propaganda, generated during the Seven Years’ War, depicts Indians and Quakers riding on the backs of Irish and German settlers-a cartoon revealing hostility against the pacifist orientations of the group that had long maintained control in Pennsylvania. 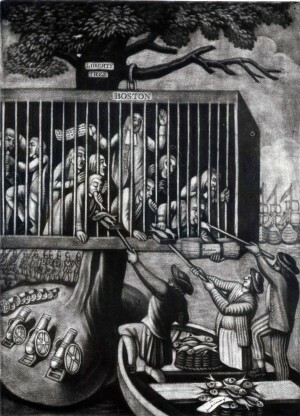 The Revolution generated similar politically charged propaganda, such as the “The Able Doctor,” [Figure 8] which depicts an iconic representation of America as a Native American woman being ravished by British officials, and “Bostonians in Distress,” [Figure 9] which shows a group of colonists suspended in a cage when their city was under siege by the British in the aftermath of the Coercive (or Intolerable) Acts. But these images, however powerful, are caricatures and need to be read symbolically – unlike the de Bry engravings, which were an effort at accurate representation. We are left, then, with a conundrum. 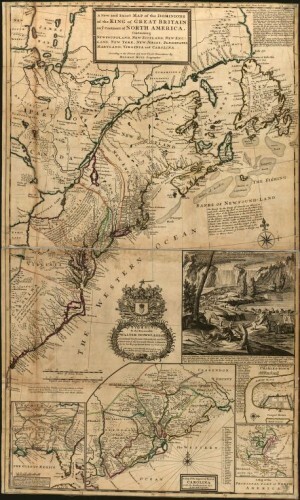 At the same time that the colonies became more sophisticated, with the population of Euro-Americans increasing by approximately eight-fold during the first three-quarters of the eighteenth century, neither the Anglo-Americans nor the English created images nearly as memorable as de Bry’s or others from the earlier age of discovery (or “age of mutual discovery,” as the historian James Axtell accurately labeled that epoch). There are images to be analyzed of course, such as cartouches on maps or over-mantle paintings or city views, such as Peter Cooper’s extraordinary c. 1720 view of Philadelphia from the Delaware River. Some of these images are extraordinary. My favorite is the so-called “Beaver Map” by the Dutch geographer Herman Moll. 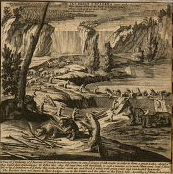 [Figure 10 and Figure 11 (detail)] Among its visual devices is an inset of beavers, marching like industrial factory workers, building an enormous dam at Niagara Falls. Moll did not seem to understand how beavers lived (in small kin-based groups), or how they carted tree limbs to their dams. But it provides insight into Europeans’ fascination with American nature, especially the idea that the Western Hemisphere possessed an environment rich with possibilities. For the early American period it might make sense to expand our approach to visual evidence. There are, for example, many places–such as Acoma, Cahokia, or Elfreth’s Alley in Philadelphia-where structures have survived intact and we can teach with pictures of these places. There are also many images to be found of materials unearthed at archaeological sites. More important, if we expand our geographical horizons there are many images to be analyzed in our classes. Among these pictures I would recommend the indigenous Incan Felipe Guaman Poma de Ayala’s pen-and-ink drawings from the early seventeenth century now in the Royal Library in Copenhagen, though available online at http://www.kb.dk/permalink/2006/poma/titlepage/es/text/?open=id3083608; the beautiful if primitively rendered views of the West Indies in the so-called Drake manuscript at the Morgan Library; and the many so-called casta paintings from New Spain or images of the Spanish conquest of Mexico contained in indigenous codices. Analysis of these images could lead to discussions about how certain cultures produced specific kinds of visual evidence. 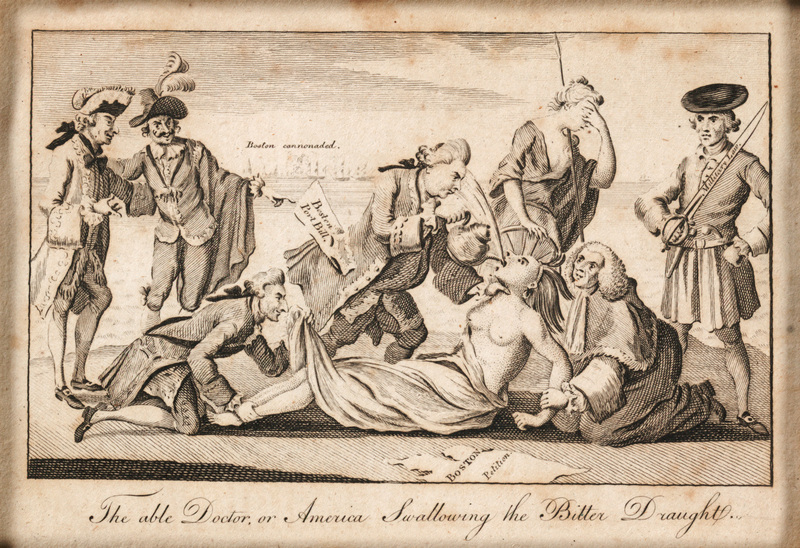 For the early American period it might make sense to expand our approach to visual evidence. There are, for example, many places–such as Acoma, Cahokia, or Elfreth’s Alley in Philadelphia-;where structures have survived intact and we can teach with pictures of these places. There are also many images to be found of materials unearthed at archaeological sites. More important, if we expand our geographical horizons there are many images to be analyzed in our classes. Among these pictures I would recommend the indigenous Incan Felipe Guaman Poma de Ayala’s pen-and-ink drawings from the early seventeenth century now in the Royal Library in Copenhagen, though available online at http://www.kb.dk/permalink/2006/poma/titlepage/es/text/?open=id3083608; the beautiful if primitively rendered views of the West Indies in the so-called Drake manuscript at the Morgan Library; and the many so-called casta paintings from New Spain or images of the Spanish conquest of Mexico contained in indigenous codices. Analysis of these images could lead to discussions about how certain cultures produced specific kinds of visual evidence.